As the chief operating officer of Manifest, Jason is involved in every aspect of the organization and oversees all programs. On the ground he coordinates the project submission process, jury process, and programming for exhibits and books as well as serving as the organization's primary grant writer and education director. He is the first point of contact for most communications regarding projects and Manifest's programming and philosophy. He also designs most Manifest publications, exhibit layouts, and PR material, and maintains this website and the organization's Facebook presence, among many other sundry tasks. Born and raised in Cincinnati, Ohio, Jason Franz attended the then museum-school, the Art Academy of Cincinnati in Eden Park and Mt. Adams, receiving his BFA degree with honors in 1988. During the first ten years of his career as an working artist Jason also served as exhibition designer and preparator at the Cincinnati Art Museum where he played a key role in establishing the Exhibition Design Department. He returned to academic life in 1996 to pursue an MFA degree at the University of Cincinnati’s College of Design, Architecture, Art and Planning, receiving his MFA in 1998. Franz left the museum at this time and began teaching. From 1997 through 2002 he developed and taught new courses for the Art Academy of Cincinnati and the University of Cincinnati in the fields of both art and design. In 2002 he was hired to head the painting and drawing programs at Xavier University in Cincinnati. He spent two years rebuilding these programs, solidifying his teaching philosophy, and laying the philosophical ground-work for Manifest. While at Xavier, he also served as the faculty advisor for the founding of the Society of Visual Arts (a student government organization), assisted with the planning for a new departmental photography program, and championed the integration of technology into all the classroom studios. In June of 2005 he left his teaching position in order to accept a second year of paid academic leave at the University while he focused his energy towards Manifest. In 2006, as Manifest was up and running under his continuing volunteer-directorship, he was invited to return to the University of Cincinnati to teach drawing on a part-time basis in the School of Design. From 2008 to 2011 he also served as Content Coordinator for the Foundation Design Drawing program. Jason continued teaching drawing at UC through the 2012 academic year. At that point he shifted all his time towards Manifest, working to build its staff and board of directors, add programs, and pave the way for the gallery expansion in fall of 2013 and Drawing Center expansion in 2016. As an artist and educator Jason is the recipient of numerous grants and awards, including an Ohio Arts Council Fellowship, a Xavier University Faculty Development Grant, two Darwin Turner teaching awards from UC, and three Summerfair Individual Artist Grants. In 2009 he was recognized with a Distinguished Alumnus Award from the Art Academy of Cincinnati. 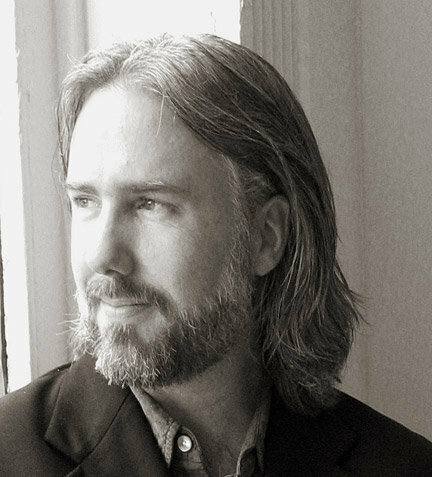 He is a three-time Independent Publishers Association (IPPY) award recipient for his work on Manifest Press’s International Drawing Annual and International Photography Annual publications. Jason has published articles and given lectures, panel talks, and presentations about Manifest, the philosophy and practice of art, and drawing as an art form across the U.S., and continues to exhibit his drawings nationally, and also accepts invitations to write articles, make presentations, provide guest critiques, and mentor students, working artists, and educators from time to time. Jason merges a passionate, motivated sense for quality developed in his ten years experience at the Cincinnati Art Museum and in his own studio work, with his dedicated and intuitive techniques of fine art and design education developed at the Art Academy, UC, and Xavier. His philosophical approach to the pedagogy of creativity, community, and art exhibition helps fuel the mission of Manifest. We welcomed Erin to the Manifest team in November 2017. A native of Cincinnati, Ohio, Erin received her BFA from the University of Cincinnati’s College of Design, Architecture, Art and Planning with dual concentrations in both Photography and Printmaking. Following graduation, she relocated to Savannah, Georgia to attend the graduate program at the Savannah College of Art and Design where she received her MFA in Photography, and later went on to work with a non-profit organization in Upstate New York. There she served in an administrative capacity while utilizing her creative background to develop much of the organization’s marketing material. Her time in the non-profit world cultivated a love for philanthropy and community involvement that continues to inform her life. 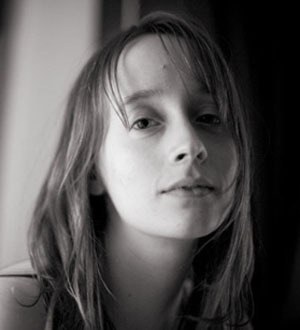 Erin has maintained a connection with Manifest throughout the years, having participated in our competitive juried exhibitions and publications from as early as 2007. She returned to Cincinnati in 2015, and is excited to help foster and support Manifest’s mission in the years to come, offering unique strengths resulting from the blend of her academic and creative backgrounds with her non-profit business experience. As the Operations Manager, Erin is involved in much of the internal on-site business of the organization. This includes communications with donors, members, board members, staff, and grantors, as well as the general accounting associated with a non-profit business, translating organizational vision and on-the-ground operational strategies to all staff and volunteers, and serving as the common denominator between board, administration, and staff. She also heads up the publication distribution for Manifest Press, and plays a key role in the coordination and production of Manifest's books. 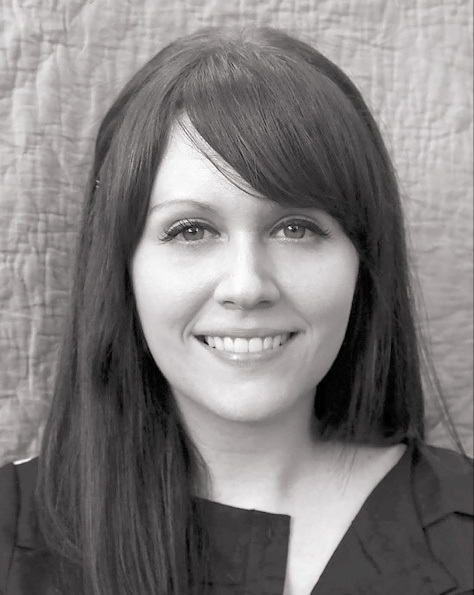 Katie joined Manifest in September 2012 after completing her MFA at the University of Massachusetts, Amherst. Originally from Villa Hills, Kentucky, she received her BFA in painting and drawing, and a BA in English composition from Northern Kentucky University. She brings three years of university teaching experience (life drawing, basic drawing, digital photography, and design), grant writing experience, and gallery experience to her dual role at Manifest. Katie is responsible for overseeing the nuts and bolts of exhibition installation, artwork coming/going, intern training, and overall presentation of the galleries. She also supports organizational development, and serves on our educational committee supporting the Drawing Center programming. Adam joined Manifest's team in July 2017 to take on the greatly expanded role of coordinating Manifest's Drawing Center program. This came after his return to Cincinnati to spend a year as one of Manifest's 2016/17 Artists in Residence during which he became intimately familiar with the organization's mission, vision, and operations. Originally from Cincinnati, Adam received his BFA degree in Painting and Art History from Tulane University (New Orleans, Louisiana) in 2004. He then went on to earn an MFA from Southern Illinois University at Carbondale, Illinois in 2007. Immediately following his studies, Adam served as the first coordinator for the Cincinnati-based nonprofit ArtWorks's mural program—overseeing their first 17 murals. During this time he also taught drawing at Sinclair Community College in Dayton, Ohio. In 2008, Mysock joined the faculty of Tulane University’s Newcomb Art Department, where he taught all levels of painting and drawing, as well as the graduate seminar on pedagogy. During his eight years at Tulane, Mysock helped pilot departmental recruitment and retention programs and led a task force focused on establishing the Department’s Foundations program. As a working artist Adam's work has been exhibited and published both nationally and internationally and is in private collections throughout the world. 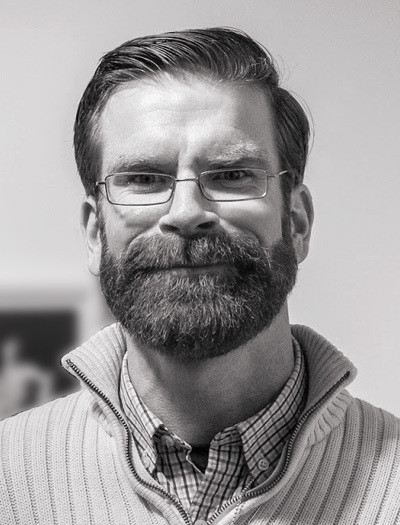 Adam coordinates all efforts related to developing and maintaining Manifest's Drawing Center educational offering, events, facility, and programs, including providing outreach to local high schools and universities. Taryn first joined Manifest as an intern in January of 2018. She was our first co-op student from the University of Cincinnati’s DAAP Fine Arts program. Taryn proved herself to be such a great fit within our small team and organization that we hired her as Operations Assistant once her academic co-op concluded. 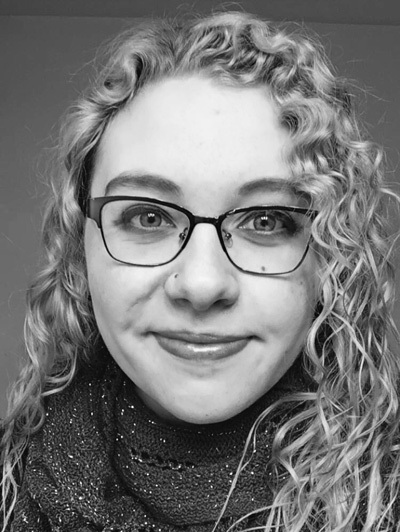 Born and raised in Cincinnati, Taryn continues working toward her BFA with special interest in drawing, printmaking, and sculpture at the University of Cincinnati. Her interest in art and design has been cultivated by a vibrant local art scene, imparting a passion for craftsmanship and quality and those centers that further the connection between community and creative exploration. Taryn’s job at Manifest serves as a supportive connector between the large work and projects handled by our program and administrative staff. With a keen eye for detail, a refined command of the written word, and a can-do attitude, Taryn brings a vibrant enthusiasm to our team, helping Manifest to realize many of its behind the scenes efforts all while supporting artists and carrying on our mission for quality. 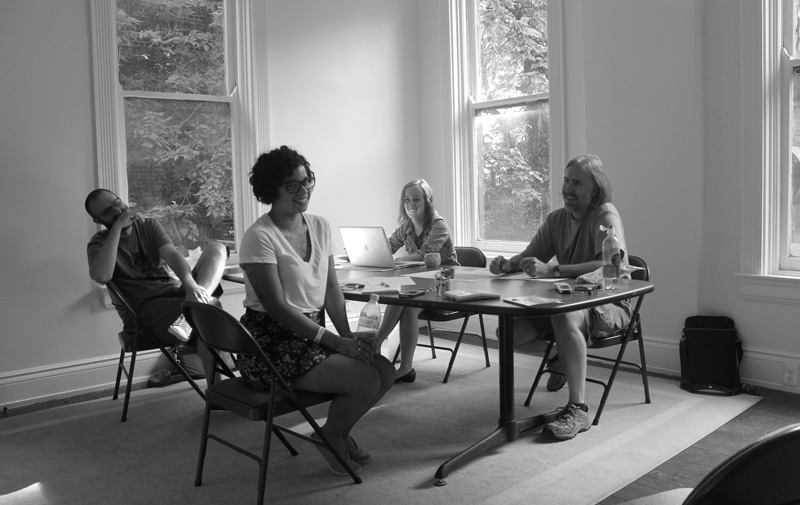 Manifest staff on July 23, 2013 (Planning meeting in 'Unit 3'). Pictured left to right: Tim Parsley, Michelle Sanchez, Katie Baker, and Jason Franz. periods in the areas of education, design, grantwriting, and with other key organizational needs.